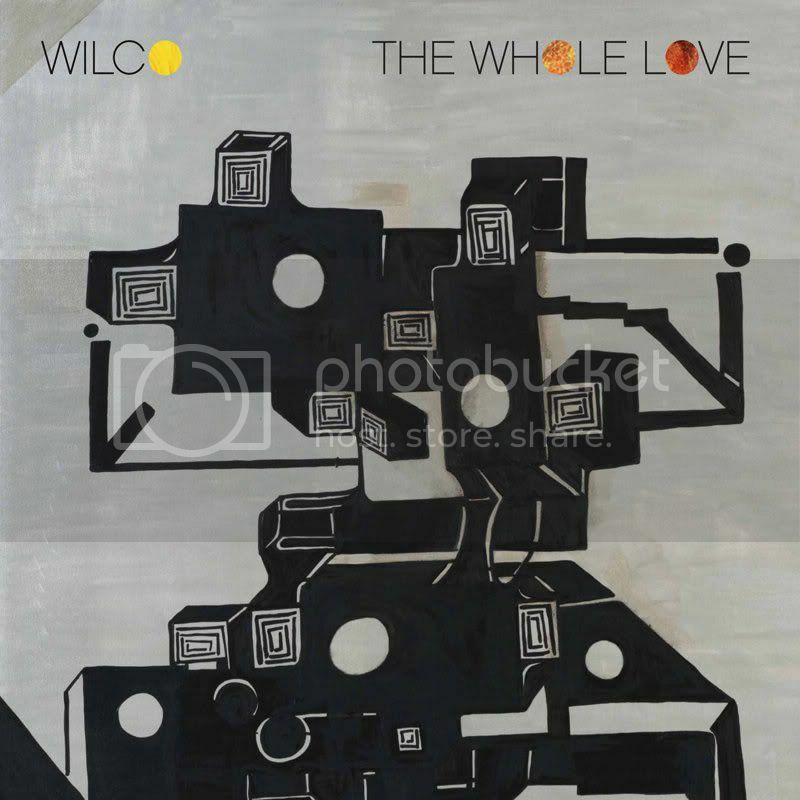 hearsoundswrite - A music blog out of South Carolina: Review: Wilco Refocuses On "The Whole Love"
Never have I been so anxious for an album to end. A curious reaction to my first taste of the new LP by this blog's most ballyhooed band. But that was exactly how I felt earlier this week: checking my iPod's screen, urging each track to slide past. Listening wasn't a chore or anything--quite the opposite. It's not that the album was too long, either. After all, surely Tweedy and crew read the Musical Surgery piece I wrote on them last year and steered clear of such dangerous waters. I desired to hear the final strains of The Whole Love because it's a damned good album. I simply didn't want it to run off the rails, and the less opportunities available to do that, the better. Unfortunately, Wilco's past two efforts have trained me to expect that at least some measure of Teva-clad dad rock might creep into the mix. And while this new one certainly flirted with that, the album ultimately thrived without any references to lawn-mowing. I think part of my anxiety was borne out of the fact that the album's first five tracks are tremendous. The opener, "Art of Almost", might lead one to believe that The Whole Love would be a hyper-progressive, dark affair. And while it is both of those things at times, that's certainly no way to describe it on the whole. But at any rate, it's a fantastic song, as is second track "I Might", the fuzz-rock lead single we'd heard a while back. "Sunloathe" is a slow-burner, featuring a Flaming Lips studio wash and the vaguely emo-ish titular lyric, "I loathe the sun." It's followed by "Dawned On Me", which was among the first to spring up at live shows. What might have been a schmaltzy feelgood pop rock track were it done by 2009's Wilco instead achieves a certain Bennett-era richness. "Black Moon" is next, and it's one of the album's strongest tracks. Low, brooding ambient-folk is something Wilco does better than just about anyone. It's not abstract like, say, "Radio Cure", but it's indicative of the unique approach to gloomy folk for which the band's become famous. The next three tracks are where things get a bit unstable. From an arrangement standpoint, "Born Alone" falls somewhere between the unadorned feel of Sky Blue Sky and the upbeat charm of Summerteeth. Unfortunately, the post-chorus guitar line, which mimics the vocal melody, is highly abrasive and comes off as a tad lazy. I would have expected a complementary arrangement instead of a grating reprise of the melody we've already heard ad nauseam. "Open Mind" is a pretty, if unimaginative, Nashville-tinged waltz with C+ lyrics but it's a serviceable track from a flow perspective. The album's weakest moment follows in "Capitol City". "Here, a Randy Newman song. Enjoy!" Indeed, it fits the bill for Newman-approved songcraft: bouncy shuffle, recitation of big city minutia, blues-seventh chords en masse. It's "Walken" without the heart. It picks up a bit of steam at the end, but on the whole, it comes perilously close to derailing the album. Things get back on track with the jaunty "Standing O", a caffeinated romp that has me forgiving them for "Capitol City" by minute two. Tweedy's vocal turn is fascinating on this one, a bit more manic and wiggly than usual but it suits him and the song well. "Rising Red Lung" is another acoustic brooder, a latter-era "Dash 7" with a soothing guitar-centric arrangement that provides a nice late-album rest. The ensuing title track is snappy and lovable, no great creative achievement, but do they all need to be? It's charming in the way some of the more lighthearted Mermaid Avenue material is; close your eyes and you'll see the cartoon blue jays swirling around as the band plays on. Also, it's begging to score the final scene of a romantic comedy some day. Look for it in a theater near you. Perhaps the album's most classically Wilco track, "One Sunday Morning (Song for Jane Smiley's Boyfriend)" blooms untraceably across a dozen minutes. Jeff Tweedy reminds us why his voice is such an effective vehicle for pained lyrics: "Outside I look lived in," he admits over softly fingerpick acoustic and a faint but steady rimshot. The song--its title referencing the prominent author who will now see a spike in sales among aging hipsters--may be the album's finest moment, and because of that, I'm left with a feeling of giddy satisfaction. Who knows how the critics will react, but as far as this blog is concerned: well done, Wilco. While I was prepared to accept the diminishing returns in the studio, I hadn't written off the band as a creative force, and that faith was rewarded. I don't know that this album will ultimately fall in with the truly elite Wilco efforts (the stretch spanning Being There to A Ghost Is Born), but I can already sense it will be a legitimately respected member of the discography.